After positioning the patient and obtaining informed consent, start examining the nasal cavities. Spray the more patent nostril with a 1:1 ratio of oxymetazoline (Afrin) 0.05% and lidocaine (Xylocaine) 4%. 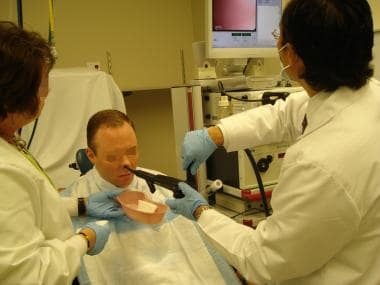 Then spray the oropharynx with lidocaine (Xylocaine) 10% and ask the patient to swallow immediately. Explain the procedure to the patient and obtain informed consent. Check all equipment before beginning the procedure (see image below). Checking all instruments is crucial before starting the endoscopy. Pass the endoscope parallel to the floor of the nose or between the middle and inferior turbinates (see image below). 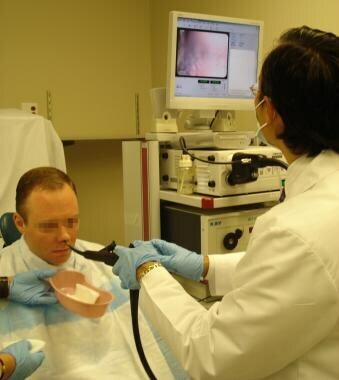 Advancement of the scope intranasally parallel to the nasal floor. Advancement of the scope at the level of the nasopharynx. Advancement of the scope past the base of the tongue. As soon as the hypopharynx is reached, ask the patient to flex his head forward to reach his chest. At that time, ask the patient to swallow. This relaxes the cricopharyngeus. See images below. 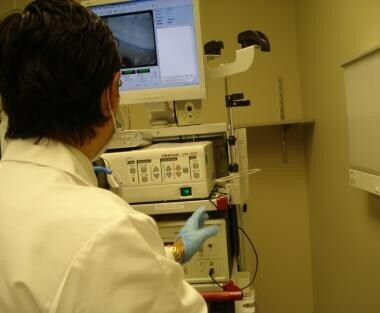 Flexible endoscope passing into the hypopharynx. 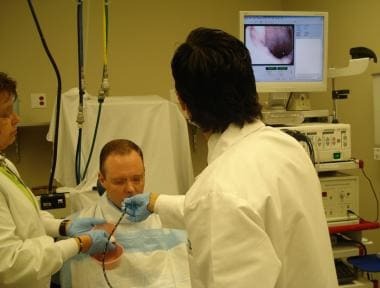 Scope passing through the cricopharyngeus as the patient is asked to swallow. Rotate the scope 360º while angulating upward to look for the gastroesophageal junction and the gastric cardia. This is called the J maneuver. See images below. 360-degree rotation of the scope to view the gastroesophageal junction (J maneuver). Air insufflation to view the stomach. Scope at the level of the gastroesophageal junction and stomach. Slow withdrawal of the scope with careful attention to the monitor. Air insufflation in the stomach. Slow withdrawal of the scope allows careful visualization of the esophageal mucosa. Bush CM, Postma GN. Transnasal esophagoscopy. Otolaryngol Clin North Am. 2013 Feb. 46 (1):41-52. [Medline]. Price T, Sharma A, Snelling J, Bennett AM, Qayyum A, Bradnam T, et al. 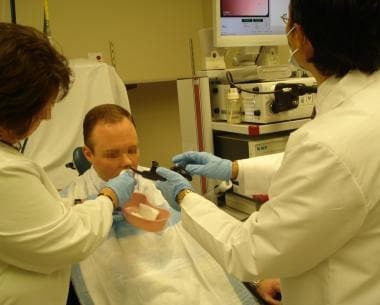 How we do it: The role of trans-nasal flexible laryngo-oesophagoscopy (TNFLO) in ENT: one year's experience in a head and neck orientated practice in the UK. Clin Otolaryngol. 2005 Dec. 30(6):551-6. [Medline]. Sabirin J, Abd Rahman M, Rajan P. Changing trends in oesophageal endoscopy: a systematic review of transnasal oesophagoscopy. ISRN Otolaryngol. 2013 Aug 1. 2013:586973. [Medline]. [Full Text]. Abou-Nader L, Wilson JA, Paleri V. Transnasal oesophagoscopy: diagnostic and management outcomes in a prospective cohort of 257 consecutive cases and practice implications. Clin Otolaryngol. 2014 Apr. 39 (2):108-13. [Medline]. Amin MR, Postma GN, Setzen M, Koufman JA. Transnasal esophagoscopy: a position statement from the American Bronchoesophagological Association (ABEA). Otolaryngol Head Neck Surg. 2009. 140(2):280. Sanyaolu LN, Jemah A, Stew B, Ingrams DR. The role of transnasal oesophagoscopy in the management of globus pharyngeus and non-progressive dysphagia. Ann R Coll Surg Engl. 2016 Jan. 98 (1):49-52. [Medline]. Sanyaolu LN, Jemah A, Stew B, Ingrams DR. The role of transnasal oesophagoscopy in the management of globus pharyngeus and non-progressive dysphagia. Ann R Coll Surg Engl. 2016 Jan. 98 (1):49-52. [Medline]. [Full Text]. Belafsky PC, Postma GN, Daniel E, Koufman JA. Transnasal esophagoscopy. Otolaryngol Head Neck Surg. 2001 Dec. 125(6):588-9. [Medline]. Cheng CC, Fang TJ, Lee TJ, et al. Role of flexible transnasal esophagoscopy and patient education in the management of globus pharyngeus. J Formos Med Assoc. 2012 Mar. 111(3):171-5. [Medline]. Peery AF, Hoppo T, Garman KS, et al. Feasibility, safety, acceptability, and yield of office-based, screening transnasal esophagoscopy (with video). Gastrointest Endosc. 2012 Mar 15. [Medline]. Parker C, Alexandridis E, Plevris J, O'Hara J, Panter S. Transnasal endoscopy: no gagging no panic!. Frontline Gastroenterol. 2016 Oct. 7 (4):246-256. [Medline]. [Full Text]. Mohammed H, Coates M, Masterson L, Chan WY, Hassan Y, Nassif R. Role of transnasal flexible laryngo-oesophagoscopy (TNFLO) in investigating patients with globus symptoms. Clin Otolaryngol. 2017 Dec. 42 (6):1311-1318. [Medline]. Su YY, Fang FM, Chuang HC, Luo SD, Chien CY. Detection of metachronous esophageal squamous carcinoma in patients with head and neck cancer with use of transnasal esophagoscopy. Head Neck. 2010 Jun. 32(6):780-5. [Medline]. Wellenstein DJ, Schutte HW, Marres HAM, Honings J, Belafsky PC, Postma GN, et al. Office-based procedures for diagnosis and treatment of esophageal pathology. Head Neck. 2017 Sep. 39 (9):1910-1919. [Medline]. Rees CJ. In-office transnasal esophagoscope-guided botulinum toxin injection of the lower esophageal sphincter. Curr Opin Otolaryngol Head Neck Surg. 2007 Dec. 15(6):409-11. [Medline]. LeBert B, McWhorter AJ, Kunduk M, et al. Secondary tracheoesophageal puncture with in-office transnasal esophagoscopy. Arch Otolaryngol Head Neck Surg. 2009 Dec. 135(12):1190-4. [Medline]. Shih CW, Hao CY, Wang YJ, Hao SP. A New Trend in the Management of Esophageal Foreign Body: Transnasal Esophagoscopy. Otolaryngol Head Neck Surg. 2015 Aug. 153 (2):189-92. [Medline]. Bennett AM, Sharma A, Price T, Montgomery PQ. The management of foreign bodies in the pharynx and oesophagus using transnasal flexible laryngo-oesophagoscopy (TNFLO). Ann R Coll Surg Engl. 2008 Jan. 90(1):13-6. [Medline]. Aviv JE, Takoudes TG, Ma G, Close LG. Office-based esophagoscopy: a preliminary report. Otolaryngol Head Neck Surg. 2001 Sep. 125(3):170-5. [Medline]. Yagi J, Adachi K, Arima N, Tanaka S, Ose T, Azumi T, et al. A prospective randomized comparative study on the safety and tolerability of transnasal esophagogastroduodenoscopy. Endoscopy. 2005 Dec. 37(12):1226-31. [Medline]. Postma GN. Transnasal esophagoscopy. Curr Opin Otolaryngol Head Neck Surg. 2006 Jun. 14(3):156-8. [Medline].